The Pittsburgh Steelers and Los Angeles Rams were both 1-0 as they faced off on October 2, 1955 at the Memorial Coliseum. The Rams were coming off a 6-5-1 record in ’54 that was only good for fourth place in the highly competitive Western Conference. They had a new head coach in Sid Gillman, most recently at the University of Cincinnati, but they had plenty of experience on both sides of the ball. 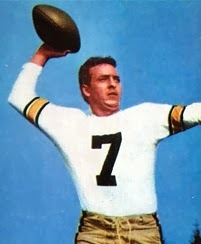 QB Norm Van Brocklin was an outstanding passer and still had ends Tom Fears and Elroy “Crazy Legs” Hirsch to throw to as well as the fleet Bob Boyd. Fullbacks Dan Towler and Tank Younger were formidable inside runners and were joined by rookie HB Ron Waller. 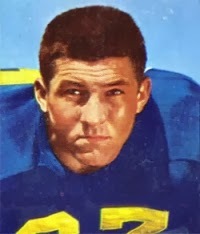 The defense contained stalwarts in DE Andy Robustelli, DHB Will Sherman, and LB Les Richter (pictured above), who also handled the placekicking. The Steelers were coached by Walt Kiesling and had also finished fourth in the Eastern Conference the previous year, but with a 5-7 record. QB Jim Finks could throw the ball effectively and the defense contained solid players such as DT Ernie Stautner and DHB Jack Butler. There were 45,816 fans in attendance at the cavernous stadium on a sunny day in southern California. In the first quarter, the Rams had a first down at the Pittsburgh 29 but a long pass by Norm Van Brocklin was intercepted by safety Richie McCabe, who made a leaping grab at the two and returned it 25 yards. The Steelers made three first downs on their ensuing series but it ended with Art Michalik attempting a 31-yard field goal that was shanked far to the left. LA responded by going 80 yards in 11 plays in a series that extended into the early second quarter. Dan Towler plowed into the end zone from a yard out for a touchdown and Les Richter followed up with the extra point. Following a fumble by the Steelers in their territory, the Rams were unable to cash in when Richter’s 28-yard field goal try hit the right upright and bounced back. Three plays later, Richter compensated for the missed field goal as he intercepted a Finks pass and returned it to the Pittsburgh seven. The Steelers held, nearly intercepting a pass, and while the restless crowd booed the decision to settle for a field goal, Richter was successful this time from 12 yards out. The Rams were up by 10-0 with just under three minutes remaining in the half. The Steelers moved the ball well on their next possession, accumulating three quick first downs to reach the LA 31. HB Lynn Chandnois gained nine yards on a draw play, but a pass by Finks to a wide-open HB Ray Mathews in the end zone was incomplete when the receiver had to adjust and stepped out of bounds as he made the catch. FB Fran Rogel ran on the next play but was short of a first down. Following offsetting penalties, Finks sneaked to the 21 for a first down as the clock reached the two-minute mark. Two pass plays, one for an apparent score, were wiped out by penalties. The Steelers ended up having to attempt a field goal and Michalik missed from 41 yards. 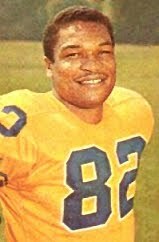 The Rams ran on first down and then Van Brocklin threw to Bob Boyd at the Pittsburgh 40 - he proceeded to race to the end zone for a 74-yard touchdown as time ran out. Richter added another extra point and the Rams, in stunning fashion, took a 17-0 lead into halftime. Pittsburgh drove to a score using 11 plays in the first five minutes of the third quarter, with Finks (pictured at left) passing to good effect. The series ended with Chandnois running around end for the last eight yards. Michalik converted to make it a 17-7 tally. The Rams had to punt on their next possession and a bad snap to Van Brocklin caused him to not be able to get the kick away. DE Bill McPeak pulled him down at the LA 11. From there, the Steelers scored in four plays, with Finks plowing over on a quarterback sneak from the one. Michalik’s extra point attempt was unsuccessful when it hit the upright, and the score remained 17-13. Bill Wade spelled Van Brocklin at quarterback on the next LA series and, fading back deep while trying to pass, fumbled and LB John Reger recovered for the Steelers at the Los Angeles 12. Chandnois ran for eight yards and, two plays later, Mathews ran two yards for a first down as the third quarter ended. Heading into the fourth quarter, the Steelers scored on a two-yard carry by Chandnois. Once again the extra point try failed but Pittsburgh was in front by a score of 19-17. Van Brocklin was back behind center for the Rams when they got the ball back and they drove 66 yards in eight plays. “The Dutchman” threw to end Tom Fears for a 17-yard touchdown and Richter added the extra point as LA went back on top by 24-19. The lead didn’t last as, on their next possession, Rams HB Corky Taylor fumbled at midfield and McCabe recovered and raced 50 yards for a TD. Michalik added the extra point this time and the score now stood at 26-24 in favor of the visitors. The Rams went three-and-out on their next series and were forced to punt, but the Steelers had a short possession as well and kicked it back. Starting at the LA 30, Van Brocklin passed to Waller and, while it appeared that he fumbled when hit and the Steelers recovered, the play was ruled a completed pass and a dead ball at that point. Van Brocklin then went deep for Boyd, who gained 27 yards and more as a crucial 15-yard penalty on the Steelers was tacked on with two seconds left on the clock. Richter kicked a 32-yard field goal as the game ended to put the Rams over the top by a score of 27-26. Los Angeles outgained the Steelers (346 yards to 258) and had more first downs (20 to 16). Both teams turned the ball over three times, but key penalties on the Steelers, who were flagged eight times, had an effect on the outcome – too much, according to their coach. A furious Walt Kiesling had to be restrained by his assistants after the game as he rushed toward the officials. Norm Van Brocklin completed 18 of 27 passes for 208 yards and two touchdowns as well as one interception. Bob Boyd (pictured at right), with the one long scoring reception, had three catches for 114 yards. For the Steelers, Jim Finks was successful on 12 of 22 passes for 113 yards with no TDs and two intercepted. Lynn Chandnois rushed for 78 yards and Fran Rogel was right behind with 73. The Rams went on to top the Western Conference with an 8-3-1 record and returned to the NFL Championship game for the first time since 1951. They lost to the Browns. Pittsburgh recovered to win its next three games before the bottom fell out. The Steelers finished up at the bottom of the Eastern Conference with a 4-8 tally.